fantastic restored Tri-ang Epoch. Keith thank you very much! 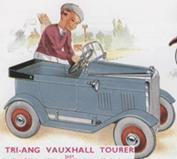 After the war Lines Bros produced their cars under the Tri-ang name, except as previously mentioned in Australia and Canada , where a licensing agreement meant Cyclops and Thistle could build the identical cars for their own markets. Because of the practice of building cars in various locations, there are some differences between the cars, and a Duke car from Canada is not the same as one built in South Africa . 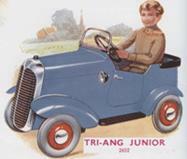 The Triang Florida built in the UK is identical to the Tornado sold in South Africa, and we believe the cars were either pressed in the UK and painted /assembled in the various countries of destination, or imported as complete units.